Joy Bauer is helping a busy family eat better with her healthy tips, smart ingredient swaps and nutritious, delicious recipes. Joy Bauer shares the smart swaps, easy tips and delicious healthy recipes she used to makeover dishes for a busy family. She gave their favorite foods a Joyful makeover to help them eat more nutritious, easy to prepare meals. Lisa is a single mom of three boys from Lubbock, Texas. Like so many parents, Lisa has little to no downtime; she has two jobs and juggles infinite family responsibilities. Lisa expressed that she has trouble preparing meals that are quick, simple, healthy — and that her kids will actually eat. Lisa asked for my help, so I showed her a few nutritious and time-saving tricks. Breakfast is the one meal where the entire family gathers in the kitchen and can enjoy eating together. Lisa often serves starchy pancakes with butter and syrup (or ready-to-eat sugary cereals) in the morning. 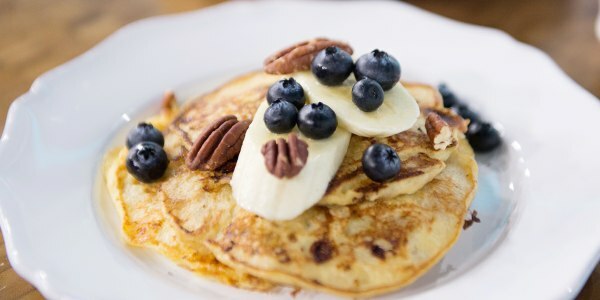 Being that it's important for kids to start the day with protein and fiber, this wholesome and creative pancake spin is a terrific alternative. The batter can be prepared the day before and stashed in the fridge, which can make life easier. Also, I snuck in a few surprising ingredients to bump up the nutrition: cottage cheese and bananas. These flapjacks will ensure that Lisa's boys stay full, satisfied and focused at school. Get the Joyful Pancake recipe here. Dinner tends to be trickier since Lisa is often at work, so her mom pitches in. Regardless of who's cooking, the family loves traditional Spanish flavors and meals. First, I encouraged Lisa to befriend her slow cooker since it's a terrific time saver and can deliver delicious hearty meals. Of course, she can google to find infinite recipes online, but I specifically shared a simple one that only requires three ingredients: chicken, salsa and taco seasoning (that's it!). Just prep it in the morning and your personal chef...I mean slow cooker...does all the work for you. Once the flavorful chicken is done, you can use the shredded meat to make crunchy tacos, tasty sandwiches, cheesy enchiladas — there are so many creative ways to serve it up. Next, I lightened up a Ochos family-favorite dish, rice and beans. Their original version used lots of unhealthy ingredients, so I gave it a makeover with a few simple and strategic swaps. I nixed the butter and lard, and used brown rice in place of white. Next, I doubled up the beans and even snuck in a vegetable. The end result in a delicious remix that's loaded with nutrition and fiber. And, after sautéeing in fabulous seasonings, Lisa's kids happily gobbled it up (phew). If you're looking for a full plan, check out Joy's Start TODAY meal plan. For more healthy tips, follow Joy on Twitter, Facebook and Instagram and check out her cookbook From Junk Food to Joy Food.